This is a great dish for prawn lovers which is a regular feature of tapas bars, particularly around Madrid. 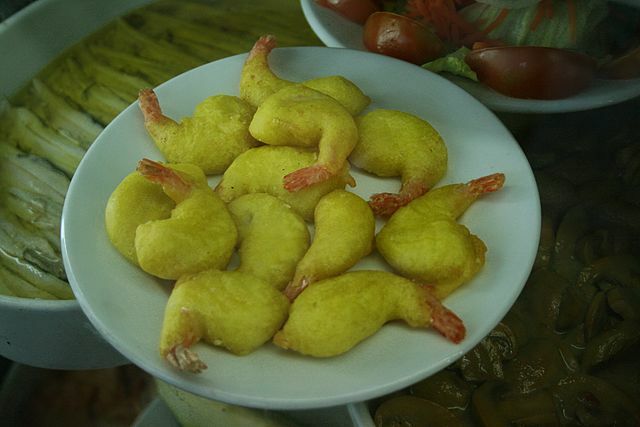 Literally it translates as “Prawns in a raincoat” which refers to the heavy tempura batter which coats the prawns before they are deep fried. It’s a very simple dish to make but try not to make the batter too thick or else the prawns become secondary to the batter which is not the intention. Unfortunately, too many tapas bars are guilty of making a batter which is far too heavy so you end up peeling it off so that you can get to the prawns. If you’re not keen on this type of batter you can always make a lighter beer batter and follow the same cooking instructions. Peel the prawns but try to leave on the end of the tail. Sprinkle them all with salt then set aside. Now you’ll need to make the batter. Beat the eggs in a bowl and add a little salt then slowly add the flour a little at a time whilst stirring constantly making sure that no lumps appear in the mixture. Now add the baking powder and saffron (in truth many Spanish kitchens use orange food colouring – ‘colorante’ – instead). Now you can heat up the oil to medium in a frying pan. Once it is hot enough you simply hold each prawn by its tail, quickly dip it into the batter mix and drop it into the hot oil until it starts to go brown (about 2 minutes). Do this for each prawn then remove them from the pan with a slotted spoon onto some kitchen roll to get rid of the excess oil then serve immediately.